While it has been obvious to many that the drop in oil prices is a weak demand issue (amid a desperate over-supply pump for revenues in a decling growth world), talking-heads have remain unashamedly bullish of growthiness and shrugged at commodities dumping at the fastest pace since Lehman. 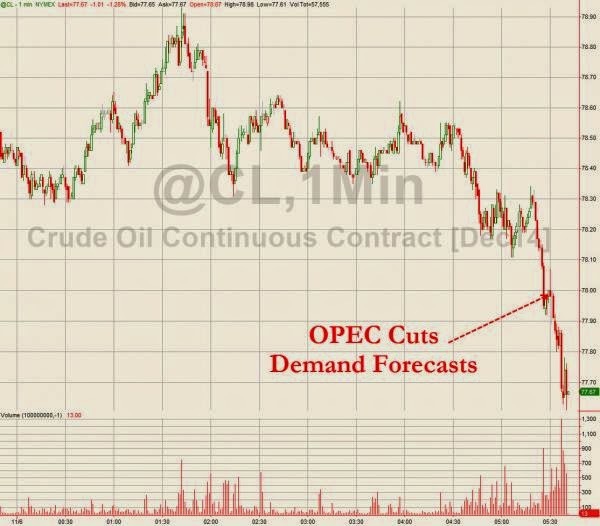 However, it appears OPEC just burst that little bubble of hope by slashing demand forecasts. Crude prices tumbled on the admission.